I think most of us have been in “the zone” at one point or another while playing a game. You know what I mean: that trance-like state where things just click and you just can’t do wrong, be it headshot after headshot in a shooter, making jump after perfectly timed jump in a platformer, or pumping out just the right units at just the right rates in a real-time strategy game. Things are challenging enough to keep you engaged, but not too challenging so that you’re able to lose yourself in the game. It’s a great feeling. Half of you are probably thinking “Hey, that reminds me of Rock Band!” Right down the the point of losing all sense of self-consciousness and flailing around with your little plastic guitar like a complete moron! 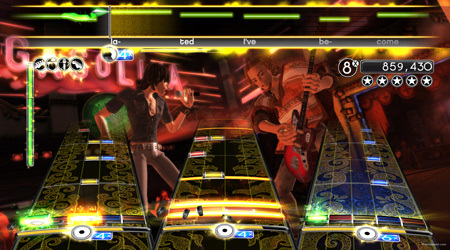 The other half of you are probably thinking “No, it’s more like Guitar Hero!” You guys! You’re both right! And indeed, two researchers at Kansas State University had the same thought when they studied flow by having subjects play Rock Band songs and adjusting the difficulty of the game for each person until they hit that sweet spot associated with flow. Too bad I couldn't find a screen cap of someone playing Pearl Jam's "Evenflow." How awesome would that have been? Flow is generally seen as a good thing by people experiencing it, and people who experience flow in a work activity are generally much happier with their work and do it better than those who don’t experience flow. The same holds true for games. So to the extent that game designers wish to engender a sense of flow in their games, they can use that list above as a checklist of targets to aim for. This also seems to present an argument for either adaptive difficulty that scales to the player’s skill or for many more grades of difficulty than the typical easy, medium, and hard. The racing game Forza 3 seems to take this concept to heart, offering a variety of “assists” that allow players to fine tune how much help they need with things like steering, traction, and even breaking around turns. This kind of thing suggests to me that paired with the right kind of feedback and clear goals, Forza 3 can bring a state of flow to more people than another game lacking such features. Interestingly 4 there is also research 5 suggesting that flow is both a state and a trait. That is, it may be a state of mind and an experience, but there are also some people who are, by dint of their very special makeup, more susceptible to falling into that delicious state of flow. My guess would be that if you took the top 10% of the fake plastic rock maniacs at Score Hero and gave them something like the Dispositional Flow Scale 6 (a tool designed to measure one’s propensity towards flow states) they’d blow the lid off that thing. 2. Fullagar, C. & Kelloway, K. (2009). Flow at work: An experience sampling approach. Journal of Occupational and Organizational Psychology, 82. 595-615. 4. Well, interesting to me. Hey, shut up, you guys. Leave me alone! 6. Jackson, S., & Eklund, R (2002). Assessing Flow in Physical Activity: The flow state scale and dispositional flow scale. Journal of Sport and Exercise Psychology. 24. 133-150. Or even Queens of the Stone Age’s “Go with the Flow”. Yeah, that occurred to me as well. I think flow is different, though, in that it requires a match between skill and challenge and other things. It has less to do with clusters of previous success and more to do with those 9 things I listed off. I love this post, it is fantastic. You are a treasure, man. Can you apply this concept to a narrative rich experience like a first person shooter do you think, or does the narrative interrupt the flow? It’s still at the experimental stage, but we hope that we will in the future be able to incorporate such techniques in commercial games to optimize the player’s experience. And this is why I love this blog. Everyone knows of the flow, I just love the fact that some researchers have actually qualified and studied it. Great stuff. Mihaly Csikszentmihalyi’s book on Flow is interesting. He makes some broad claims about the relationship between flow and happiness. A nice explication of flow. My only gripe is that its examples tend to fit the assumption of too many game designers that only action-oriented, adrenaline-pumping simulations of physical activities can be “flow” experiences. Examples of flow experiences in puzzle-solving or emotional comprehension envionments might help remind game designers that it’s possible to have highly engaging entertainment experiences that aren’t just about stimulating fast-twitch muscles. Otherwise, an excellent intro to the concept of flow from the viewpoint of computer games. Thanks! I would think that narrative heavy elements and cut scenes would probably interrupt the flow, but depending on the game you might be able to get right back into it. Wow, very cool. Thanks for the links! I’ll check them out. Yeah, I’m seeing a lot of that. People saying “Cool, I’ve always known about that, I just didn’t know that it had been studied outside of games. Which is kind of ironic. Yeah, I’ve read some articles by him, but not his book. It’s on my wish list. Thanks! But the rhythm games that are the focus of the article don’t quite fit into the “action-oriented, adrenaline=pumping simulations” mold. I agree that puzzle games could fit, too. Tetris, Puzzle Quest, Bejeweled, etc. Heck, I can even get into a state of flow on a good game of Bookworm on my iPhone. I came across your blog a few weeks ago when someone linked it to me in a discussion of game psychology. It’s actually an area of interest and study to me as well, though career-wise I target my research towards physically active games in health promotion. Same basic stuff: making games more fun to get more people to play them more often. Of course as a lifelong gamer I can’t help but draw the parallels to video games, and THEN to my career (though I know deep in my heart which is the more virtuous). This would probably depend heavily on the gamer in question. I’ve known some people who play solely for the gameplay and care nothing about the story, and for those people it’s probably true; however, it goes the other way and all places in between as well. I’m not sure how well read you are on intrinsic motivation in general, but “fantasy” is one of the traits thought to contribute to flow and other autotelic endeavors. Afterall, people frequently experience flow when watching movies or reading books, and for many people the cutscenes in video games are no different. I think self determination theory (Deci and Ryan) is a more complete model of intrinsic motivation than flow is currently, but Csikszentmihalyi certainly has some important insights to add. Feel free to email me if you ever want to discuss game psych. I’d be happy to talk to you about the subject! this got me thinking of a different thing i experienced and i was wondering if you could to a piece on it? basically i found that whenever im stock on a difficult section in a game where it requires quick reflexes(like a mini game) it help if i distract my self while playing (for example talking to my friend or talking on the phone). i remember the first time i noticed it was in jak 2 and there was this whack-a-mole like mini game which i had trouble beating and the more i focused the less score i got!my phone rang and i was talking while playing it and before i knew i got the required score.i tried this numerous times since then with the same results by the way. Sounds like you may be better versed than I on the flow literature. I’ve only really read a few things since it doesn’t apply to my every day work. I’ll keep the invitation to discuss in mind, but I hope you keep coming back to the site and commenting as well! Your comments make me think of a concept called “action identification.” It’s been a while, but from what I recall it’s how much we have to think about performing an action versus being able to do it “on autopilot.” Malcom Gladwell also wrote an interesting article summarizing the psychology of failure that kind of touches on this stuff. You can read it for free here. Oh sure, I’ll keep coming back from time to time to comment. In fact, I would be happy to “peer review” your articles if you’d like. I’m not that well-versed on the flow literature– I’ve read more summaries of Cheesamahiya’s (still struggle pronouncing his name) work than his actual publications. My familiarity comes through studying motivational psych in the context of educational psych. Speaking of which, “action identification” is a new term to me, but the concept sounds much like the underlying cause of test anxiety, which would definitely relate to aiat’s situation. Essentially you have limited working memory, and people with test/performance anxiety are dedicating more of that working memory towards metacognitive processes like thinking about the activity, consequences of failure, etc. As a result, the amount of attention you can give to the task at hand suffers. @aiat @Jamie — Your thoughts reminded me of a phenomenon I discovered when I was a kid. Having my bedroom on the second story forced a lot of up-and-down the stairs. I found that if I didn’t think about it, I could really blow down the stairs, my feet twinkling so fast. But if I thought about it even a little, I lost it and would have to slow down or crash. I wouldn’t mention it if I didn’t take it a bit further — do dancers experience flow? I’m sure they do, that’s what makes all the practice worthwhile. So, connecting the dots, “action identification” and “flow” are two facets of the same idea — emotional reward for doing something well after lots of practice. Yes, practice. I can’t think of any time that I’ve experienced flow on the very first level of a game (unless it’s the 50th time I’ve played that level, thank you Super Mario). Flow seems to stem from not just a balance of difficulty but also a comfortable ramp-up that allows the player to hone their skills to achieve flow. And the sooner the skills are honed, the sooner the player receives the emotional rewards. Then, for the rest of the game he’s just looking for his next “hit” of flow. I’m sure that dancers experience flow the same way that other athletes do. If I’m not mistaken, that’s kind of the area where the study of flow had its genesis. It’s only moved into the world of work in recent years. I also think that your hypothesis that flow only comes with some familiarity and practice would be supported in general. Especially to the extent that feedback isn’t immediate and goals aren’t made clear off the bat. You’ve got to have some time to learn the system and mechanics. I think they’re probably related. Test anxiety (and anxiety in general) has to do with diverting mental resources that otherwise would go to the task at hand, be it remembering facts, doing math, or serving a tennis ball.